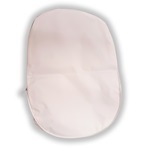 Refractor/Phoropter Cover - 12" x 16"
Oval white Refractor/Phoropter dust cover. Cover is oval shaped with a zipper on the bottom. Measures 16" tall and 12" wide. Manufactured by R.J.'s. Comes as singles. 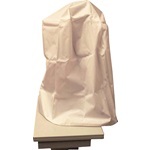 Slit Lamp Cover - Long, 27" x 15" x 15"
Long white slit lamp dust cover. Top is square measuring 15" x 15" and edges hang down 27" to cover equipment. Manufactured by R.J.'s. Comes as singles.